With the growing popularity of axe throwing, we are happy to announce our Mississauga location has moved into a bigger and badder axe throwing hot spot. We are still situated on Tomken Road but have moved in a new facility that includes five lanes of axe throwing with a total of 10 targets. 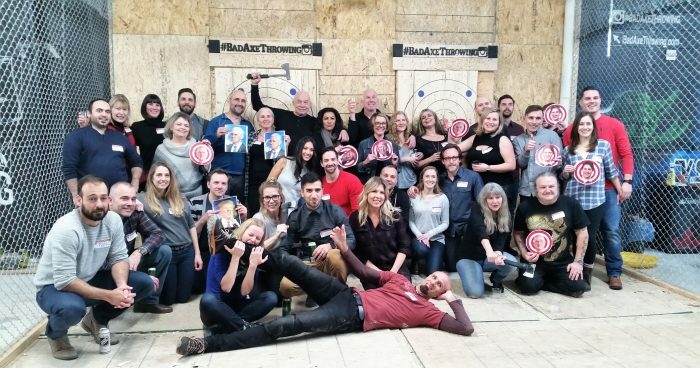 With this trendy new sport taking off, Bad Axe Throwing now has larger facilities to accommodate the growing demand of axe throwing in Mississauga. We are the biggest recreational axe throwing company with 10 venues across Canada and now in Chicago. The Mississauga location is Bad Axe Throwing’s largest location and can host up to 120 people. This spacious environment not only gives you ample room but also allows for larger groups such as birthday parties, corporate events, bachelor/bachelorette parties, and any other special occasions. With the relocation of the Mississauga venue last April 2016, we’ve have successfully hosted more parties and helped create lasting memories. Whether your new, slightly hesitant or want to show off your skills, at Bad Axe Throwing will show you how to throw an axe and ensure your event is a memorable one. Every event is hosted by a coach who will help guide, support and encourage that inner Lumber Warrior to step up. We are thrilled to welcome parties of all sizes to book their next event and have a great time.